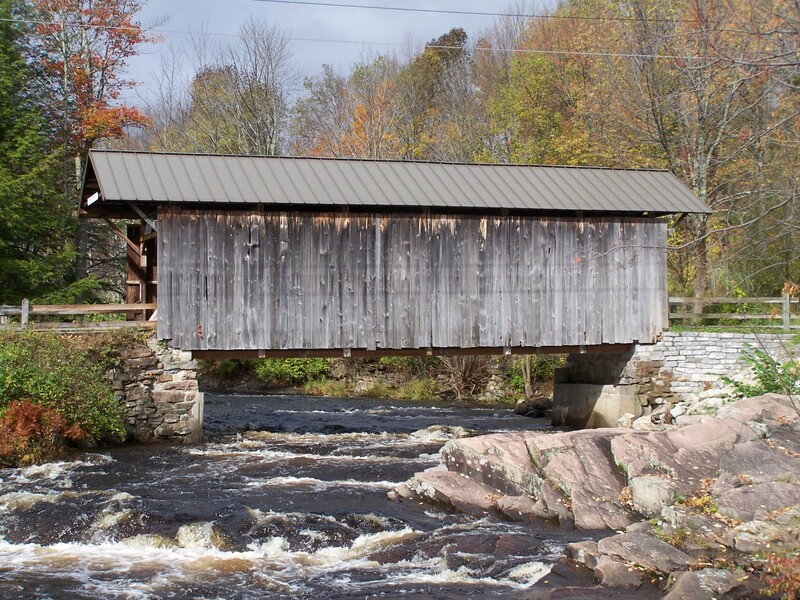 Salisbury Center Bridge was originally constructed in 1857 at the home of Alvah Hopson, due to his ailing health. The bridge was later moved to its present location (one of the first pre-fab building projects?) It was listed on the National Register of Historic Places on March 8, 1978. The bridge is located in the Village of Salisbury Center over Spruce Creek. It is constructed of Multiple Kingposts and Burr arch truss styles and is a single span of 50 feet in length. 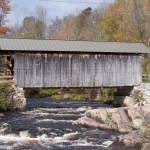 The Salisbury Center Covered Bridge is the only covered bridge still standing in Herkimer County and is owned and maintained by the village of Salisbury Center and carries traffic across Spruce Creek. 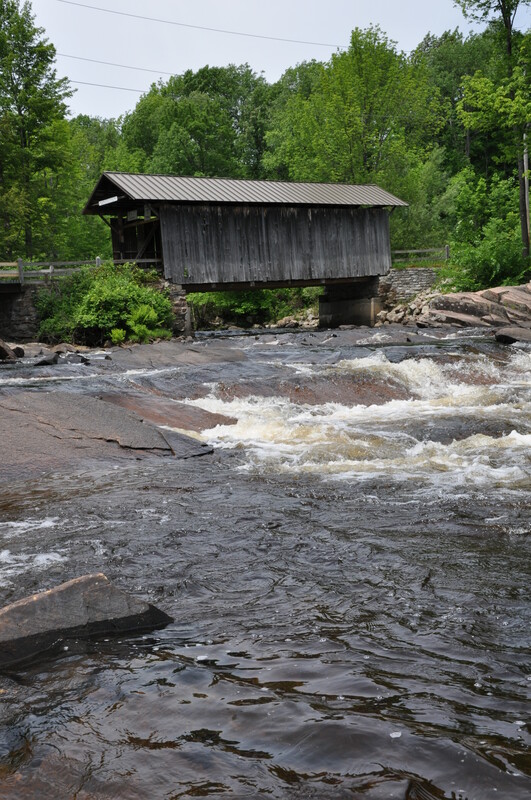 Spruce Creek, only 35 miles long, once claimed seven covered bridges, all in the Town of Salisbury in Herkimer County. Built by Alvah Hopson in 1875, this 50-foot-long, single span structure incorporates a Burr Arch. 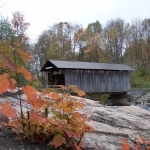 It is one of three authentic Burr arch truss bridges (the other two being the Hyde Hall and Perrine’s Covered Bridges) in the state. 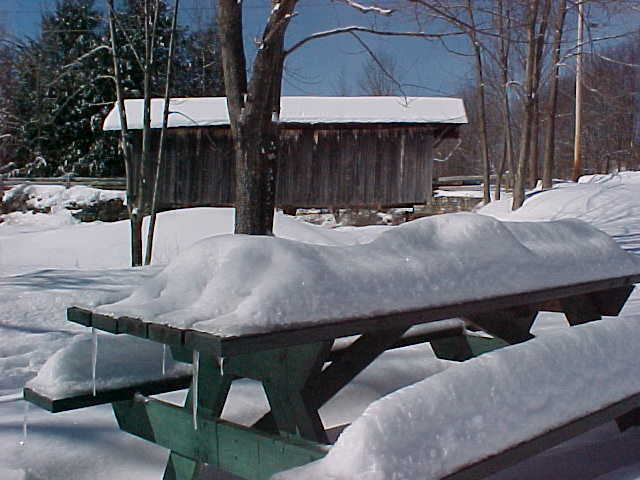 It is also one of five covered bridges in New York State that has a timber approach. Mr. Hopson built this bridge near his home and then dragged it to the Spruce Creek location where it still stands today. The original construction cost was $478. The area was first settled in the late 18th century. Many emigrants came to this hilly countryside from Salisbury, Connecticut and kept the name of their old hometown. Others flocked from diversified parts of “The East.” Alvarius Hopson moved his family of six sons and five daughters to Salisbury during that time of greatest population influx. 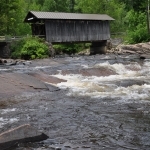 A descendant of Alvarius was Alvah Hopson, the man who built many covered bridges in Herkimer County, including the Salisbury Center Covered Bridge. The last bridge he built was probably the first prefabricated structure in that area. 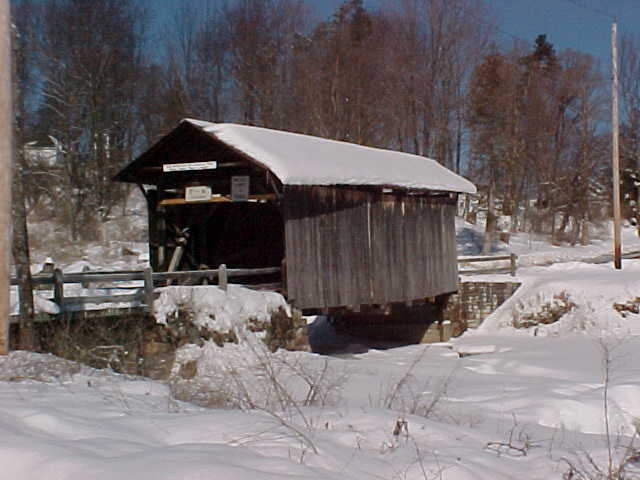 The bridge has survived the rigors of severe winter weather, travel of the horse and buggy days, as well as the automobile age. By 1962, it had fallen into disrepair and was closed to traffic. After 2 years, the Grange instituted a project to save the bridge. The Salisbury Town Board and the highway commissioner were requested to repair the bridge and reopened it to traffic. Abutments were installed on the north side, the bridge was shored up with new supports and it was leveled. New railings were installed, new planks laid on the traffic area, braces were replaced, and gravel was laid at both entrances. However, in 1963, the bridge collapsed under the weight of snow and was once again repaired. It was re-opened to traffic in August of 1964. In the 1970’s it was once again repaired. 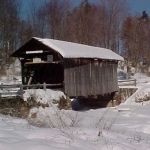 Years of ice damage had caused the bridge to sag, but quick maintenance by the town preserved it from extensive damage. Replacement boards along the walls, and new retaining walls along the creek, kept the bridge stable. 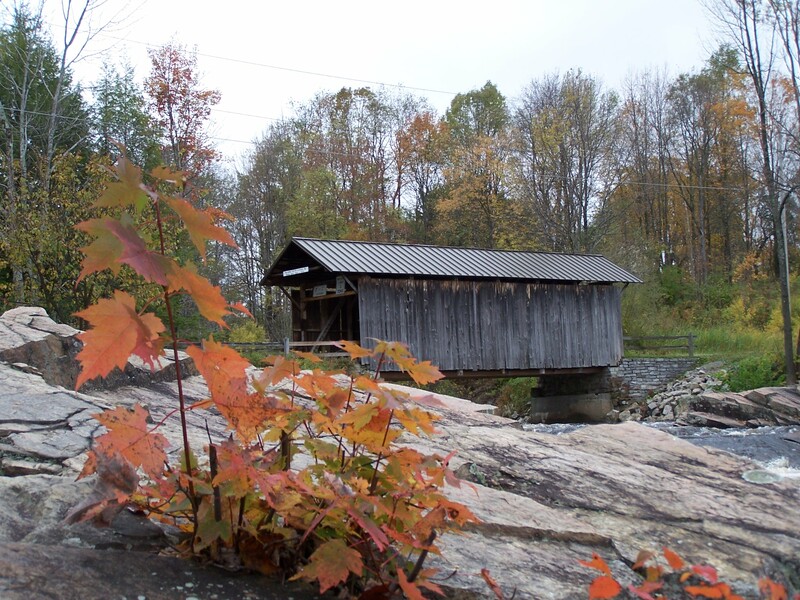 Fortunately, in 2002, Salisbury Center received a grant of $153,500 to assist in the rehabilitation of the Salisbury Center Covered Bridge. Through the grant, the town was able to replace the structure’s horizontal, diagonal and vertical beams with newer beams better suited to carry the weight. This eliminated the sag in the bridge. The bridge was also fitted with a new roof. Further preservation of the bridge included the spraying of the interior with oil fire-retardant. 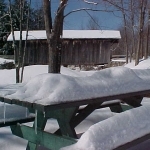 The restoration work was completed and the Salisbury Center Covered Bridge was reopened to the public once again on August 18, 2004. This bridge is an integral part of the town’s history and is pictured in its official seal. Turn off State Route 29 and State Route 29A onto Water Street, by the Library – be sure to see the stained glass window, representing the bridge, at the Library if time permits. Signs clearly mark the way.